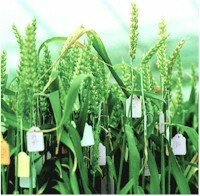 The introduction of GM crops and food has raised controversy around the world. Questions include whether GM crops will harm the environment or GM foods be damaging to health. Because the technology is currently largely in the private sector, there are also issues of how, and in whose interests, it will be used. GeneWatch UK is working to ensure the authorisation process for GM crops and foods is rigorous and takes a precautionary approach. We are also campaigning for liability rules that will compensate farmers for contamination of their products and require the biotechnology industry to pay for putting things right if environmental harm arises from the use of GM organisms. From this page you can find basic information about GM crops and food as well as more details about the areas on which GeneWatch works. Most GM crops planted today (about 85% by land area) are genetically engineered to be resistant to herbicides (weedkillers). This is so that they can be blanket sprayed with weedkiller yet the crop will still survive. Most of the crops are so-called "RoundUp Ready" crops which are tolerant to the weedkiller glyphosate (brandname RoundUp). Information about problems caused by these herbicide-tolerant GM crops can be found here. How GM crops are made, the companies involved, and the main environmental, health and socio-economic issues, including the debate about whether GM crops are needed to feed the world. Information on the main commercial GM crops and where they are grown, including GM food and feed coming into Britain. Industry pipelines and future promises, including nutritionally-altered crops and drought-tolerant crops. Read about how GM crops are regulated in Britain and the European Union. Key events in the development of GM crops in the USA and attempts to introduce them to Britain and Europe. Companies are lobbying for new developments in genetic engineering to fall outside Europe's regulations on Genetically Modified Organisms (GMOs).